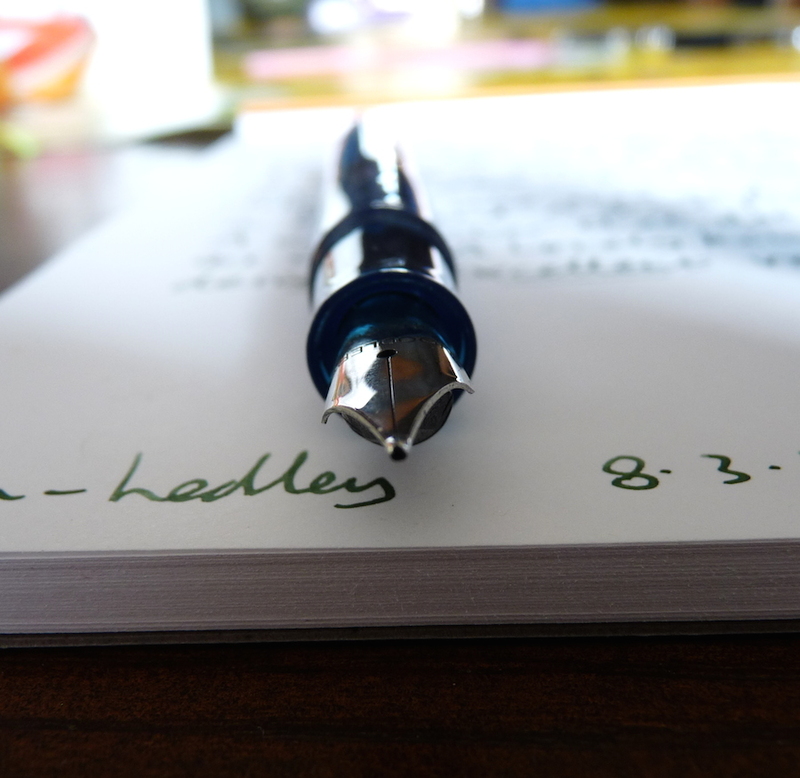 Noodler’s Konrad fountain pen review – Pens! Paper! Pencils! A good pen is a pen that brings you joy when you pick it up and write. That has nothing to do with price, nib goldiness, filling mechanism or any other objective quality. It’s hard to define and it will be different for every individual person. 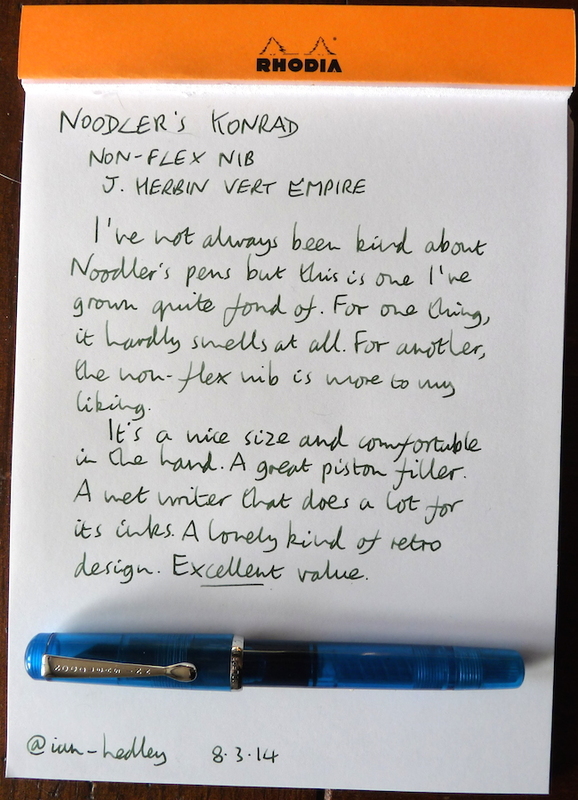 The Noodler’s Konrad is, in our little pen-world, dead cheap. Yet it brings me an awful lot of joy every time I use it. This Noodler’s Konrad is my third Noodler’s pen and my second Konrad. My first Konrad I managed to break which was a shame even though I didn’t actually like the pen all that much. It was a clear demonstrator and straight out of the box it just looked scruffy and worn. I also have a Nib Creaper, which I like a lot, and an Ahab, which I do quite like except for the smell. (Apparently the version I have, the Carnilan Honey Demonstator, is particularly stinky.) I don’t tend to use them very much because they both have flex nibs and I am not a flexy kind of person (both in terms of nibs and in terms of my ability to touch my toes). (My toes are always just a little bit too far away.) 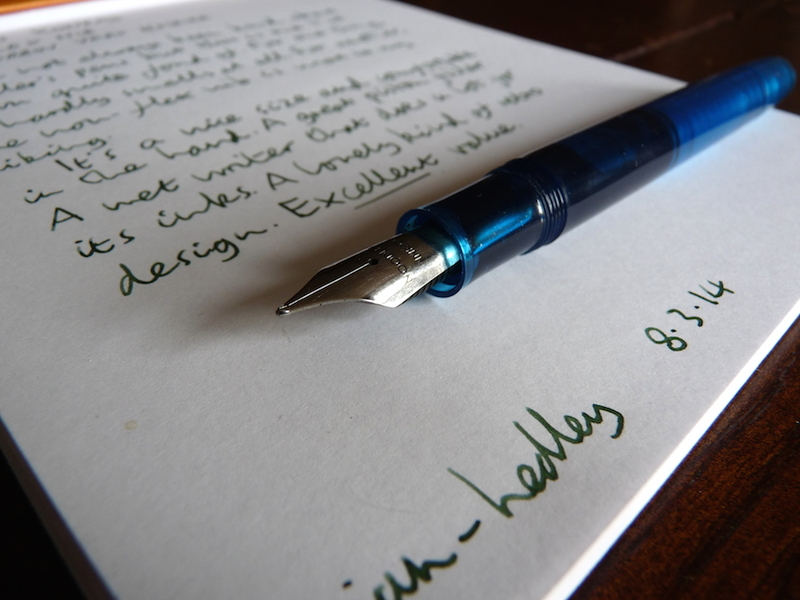 So I was very pleased to take up the offer of this Hudson Bay Fathom Demonstrator with a medium non-flex nib from Pure Pens. The blue resin looks good and doesn’t smell much at all. (And, actually, what smell there is isn’t too horrid.) It’s a good size and feels warm and comfortable in the hand. 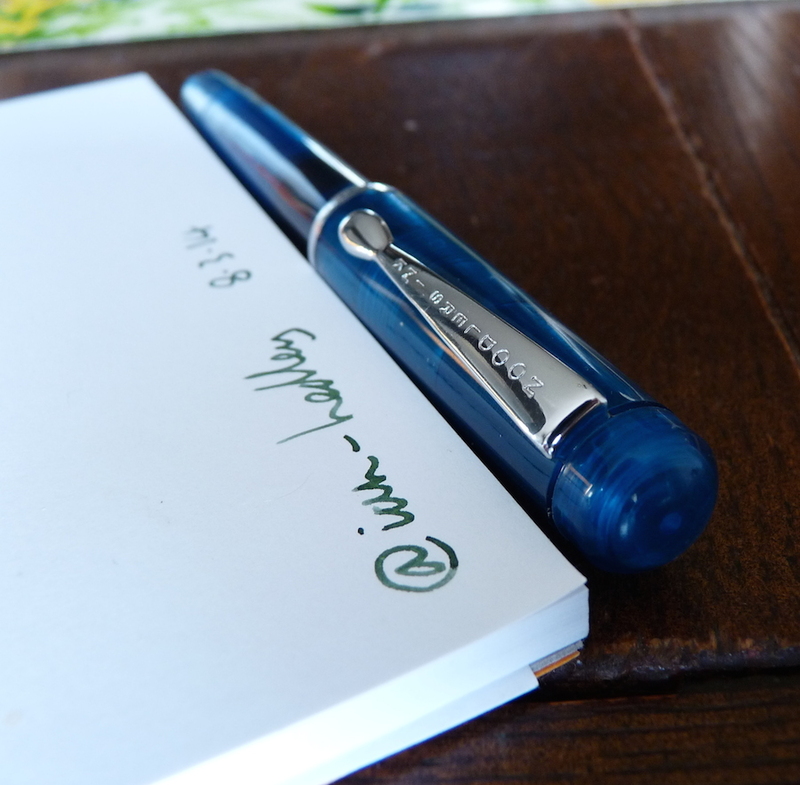 Despite it’s distinct non-orangeness, it is a good looking pen and one of the few pens I have that has been remarked upon by non-pen-addict friends. The pen as a whole has a lovely kind of 50s feel to it. It makes me want to drive an open-topped Ford Mustang to a diner. Wherein I would use this pen to write an angst-ridden slightly surreal novel that everyone would pretend to understand. 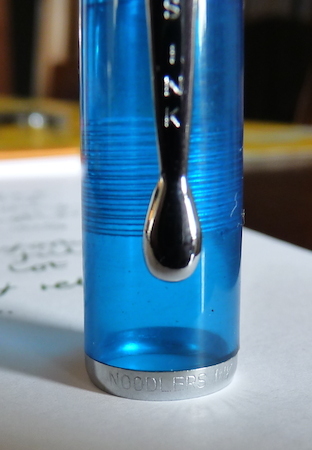 This is a piston-filling pen and holds a good amount of ink. The cap screws on, posts and has a robust clip. The nib is as hard as a nail but writes smoothly. It’s quite wet and brings out any shading that’s present in the ink. This Noodler’s Konrad is a great pen, especially for the price. With the non-flex nib, it would suit a beginner well but it also has something to offer all of us: it has character and personality. Something Noodler’s specialises in. 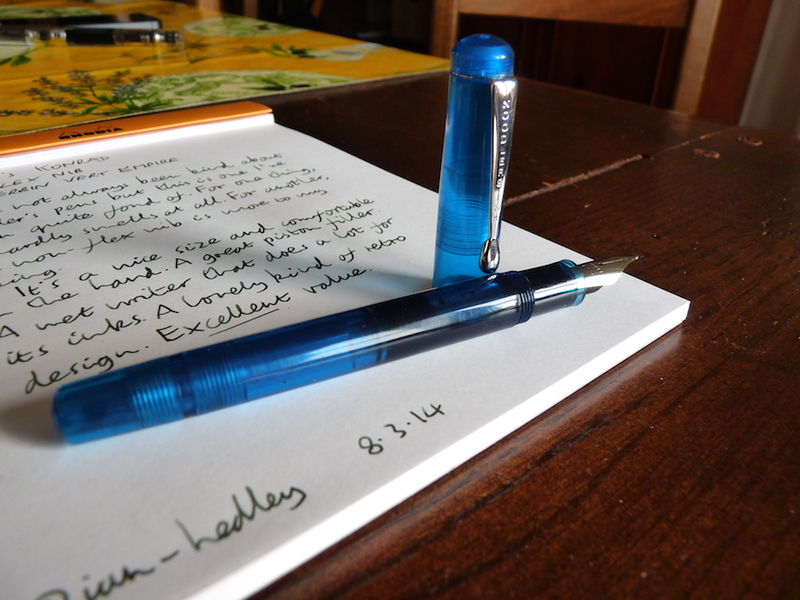 Many thanks to Pure Pens for sending me this pen to review. These are my own views and were not influenced by Pure Pens in any way.